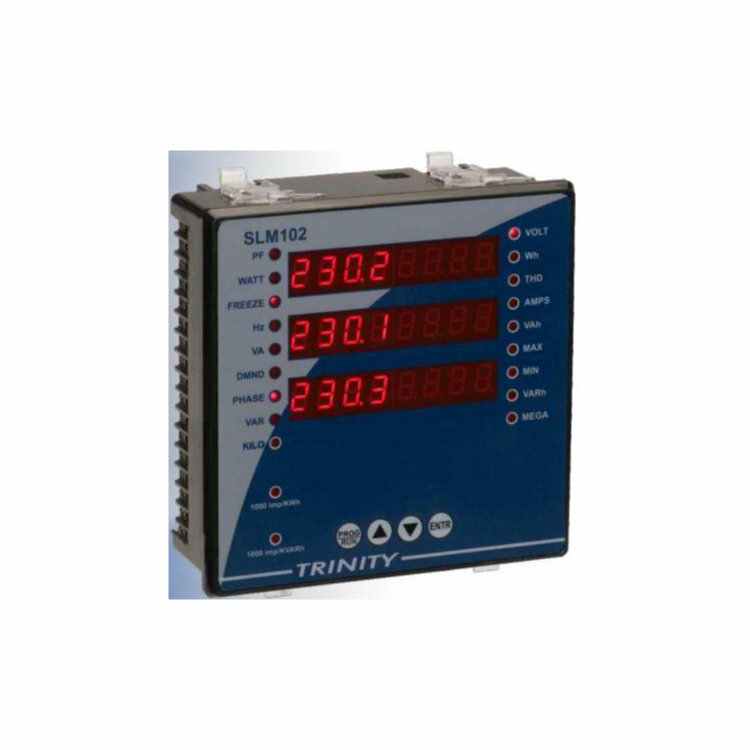 Exceeds class 0.2 revenue accuracy in Power & Energy Metering. On board Ethernet port supporting TCT/IP protocol. Acts as a small web-server. Also supports MODBUS TCP/IP. RS485 port with MODBUS-RTU protocol. Demand Measurement: Fixed or sliding. KW or KVA. Harmonics measurement: All six waveforms upto 29th including THD. Bright Red LED display. Three rows of 8-digits each ensure unbroken display of even large energy register values. Four relay outputs for Alarm & Trip. Limits are field programmable. Datalogging of all parameters for load pattern analysis. 2 Mbytes memory on-board. USB 2.0 port to download logged data. USB 2.0 port based programming of field selectable parameters. SLM102 also measures the minimum & maximum values and also allows definition of events, so that the user can define the parameter of interest, event definition value and related time delays. SLM102 measures the odd harmonics for 3Ø voltages and 3Ø currents upto 29th, includidng THDs for each waveform. The SLM102 has 2Mb on-board non-volatile memory. The unit has a user programmable log capacity, that is the log duration is site selectable. A complete electrical system snap-shot is saved, to be later downloaded using the USB 2.0 port, into a PC based utility supplied free by Trinity. The SLM102 has four relay outputs, related at 3A. These can be used for alarm/trip events. The use of these relays is totally field configurable, for the parameter on which to operate, the value on which to trip, the delay offer which to trip and the value at which to open. This enables the SLM102 to be used as a maximum demand controller. The SLM102 has a standard Ethernet-TCP/IP connection. Multiple socket Ethernet connectivity enables the unit to respond to as many as 12 different requests. The SLM102 can act as a small web-server.This on-board web-sever, offers quick and easy access to basic measurement, without special software. Built-in web pages display a range of power, energy and basic power quality information through any web enabled device. It also supports MODBUS-TCP/IP protocol. Self Power. Unit has in-built 3-phase supply with an operating range of 50 VAC - 480 VAC, 50-60 Hz. Two LEDs for Active and Reactive Energy (1000 impulse / KWh or KVARh). Bezel : 144 mm X 144 mm.